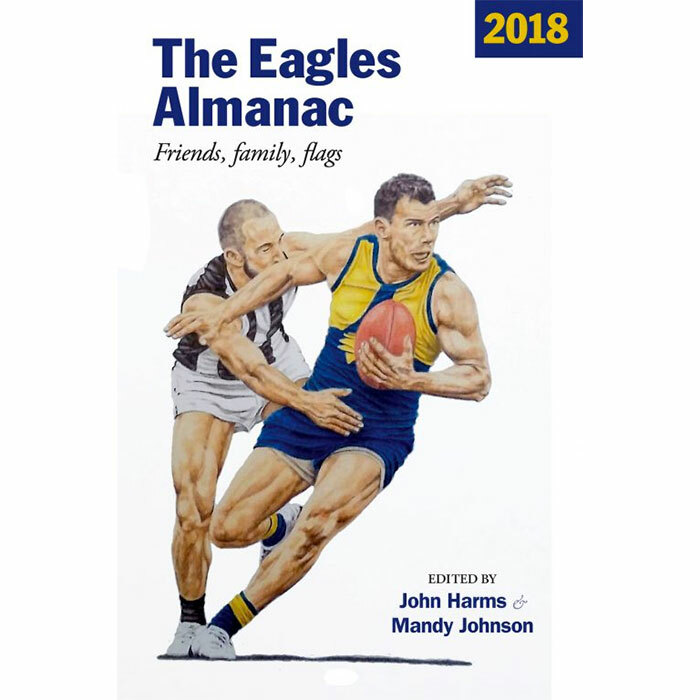 Over forty writers tell the story of the Eagles premiership year. Order now, for delivery from mid-December. Includes FREE shipping to Australian addresses! 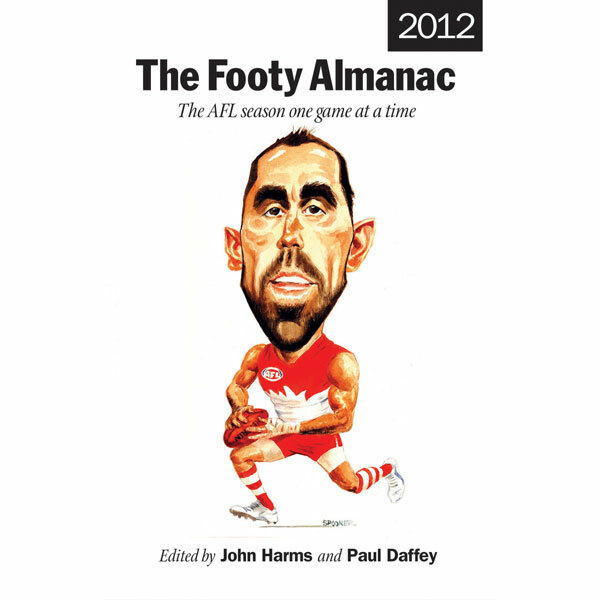 Please do not use this order form for international orders; please email us first at sales@footyalmanac.com.au. 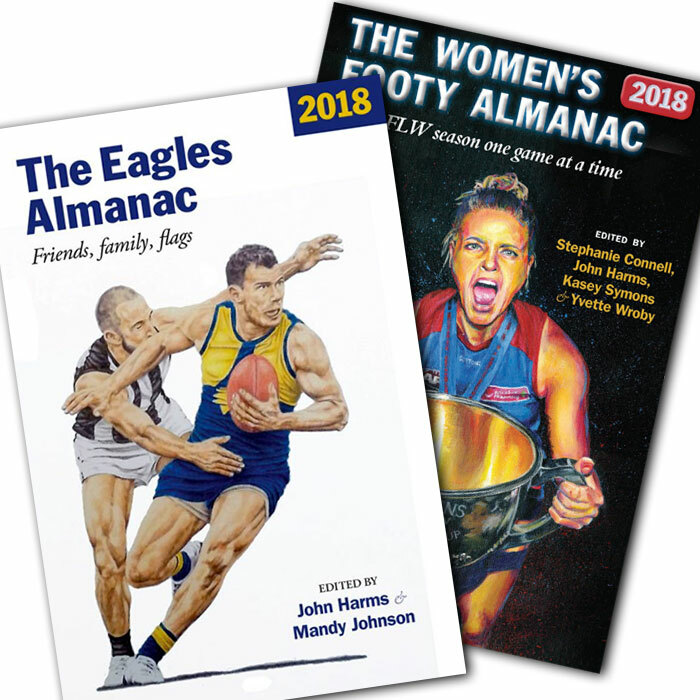 Save $$$ when ordering The Eagles and Women's Footy Almanac 2018 bundle! Note:Order now, for delivery from mid-December. Support the Almanac by becoming a member in 2019. An Almanac publication of your choice. A Footy Almanac stubbie holder. 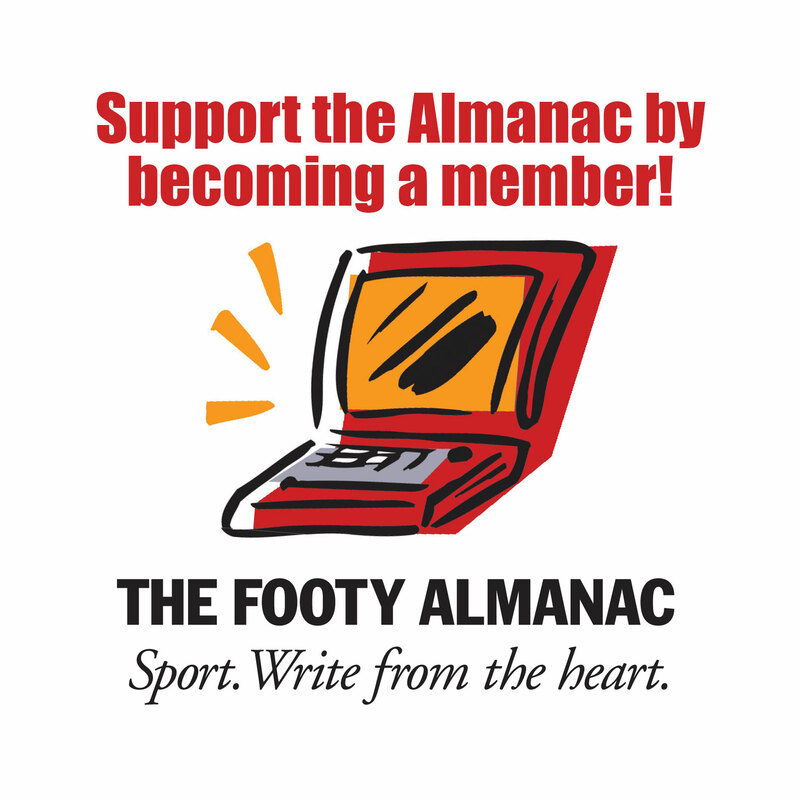 A Footy Almanac bumper sticker. Priority booking to the Almanac Grand Final Lunch. 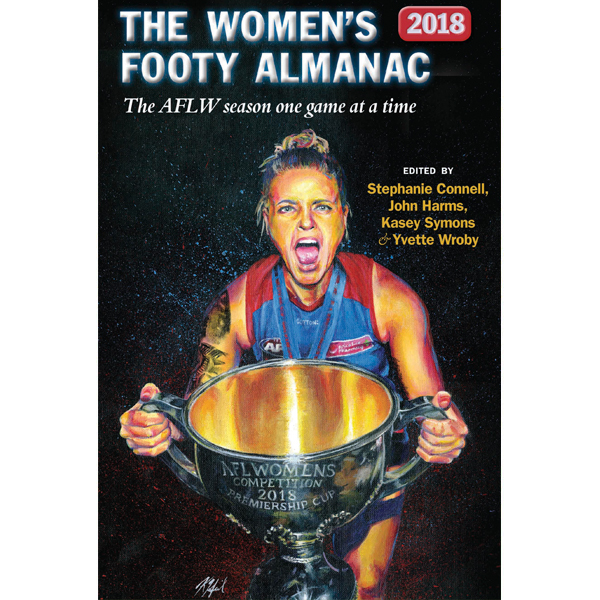 The Women’s Footy Almanac 2018 tells the story of the 2018 AFLW season and includes other pieces on women’s footy. It will be published in August, 2018. However, you can pre-order now. 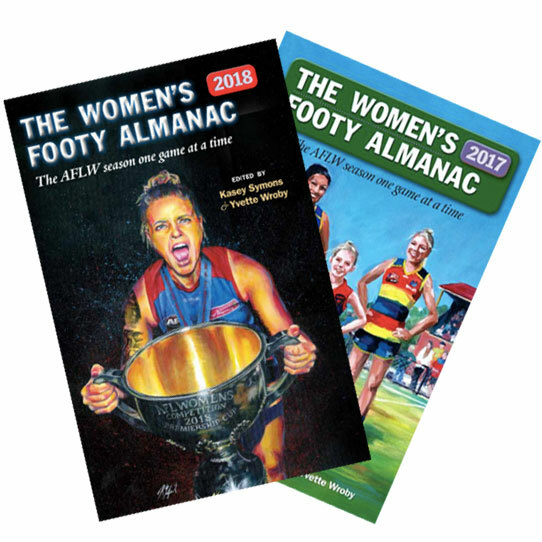 The only book bundle that comprehensively covers both AFLW seasons. 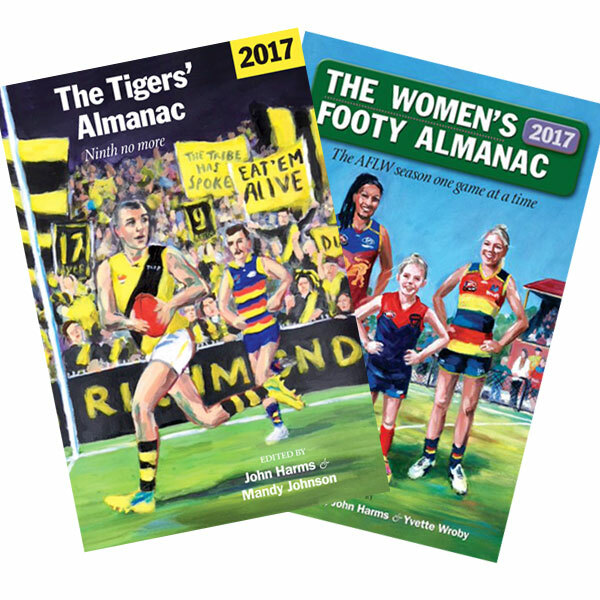 Save $$$ when ordering The Women's Footy Almanac 2017/2018 bundle! 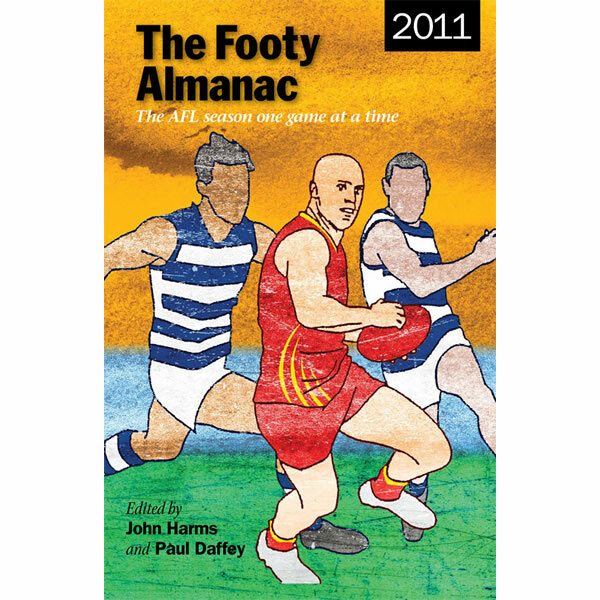 For the first time we can offer a men’s and women’s Almanac for a single year. Richmond fans have been in a state of footy nirvana since their amazing win in the 2017 Grand Final. 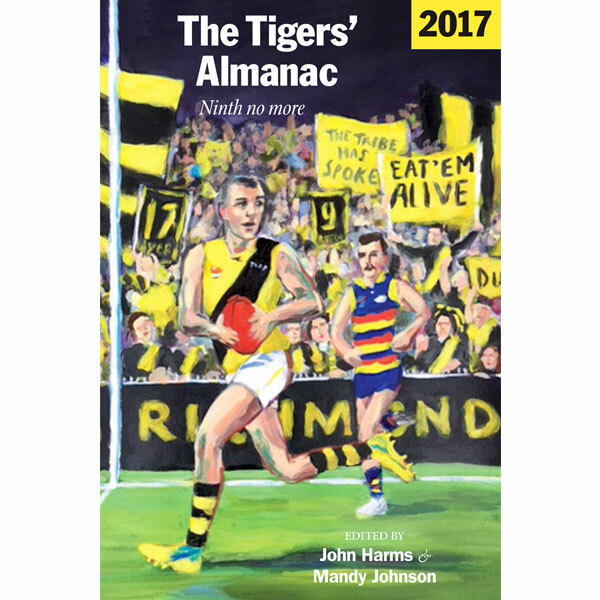 Well now they can re-live every moment of the season with this book which proves once and for all that the Tigers are good for football. Sixty fans of the Yellow and Black have produced 250+ pages of Tiger-love and catharsis and pure joy. 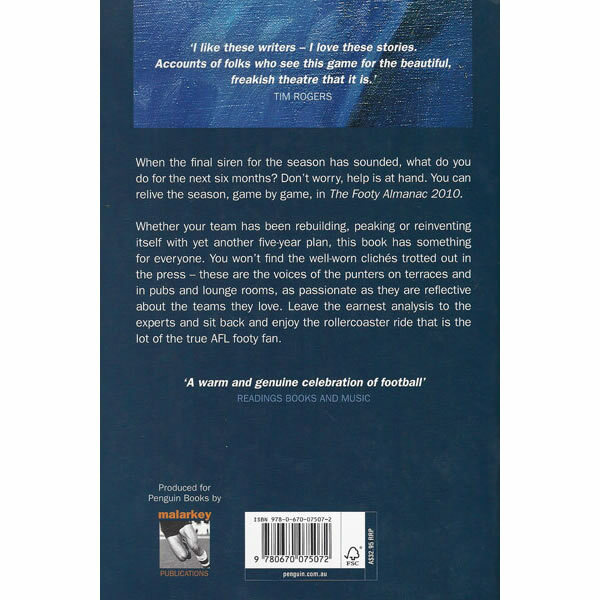 It includes history, memoir, reflection, and a game by game account of the season. Eat ‘em Alive! 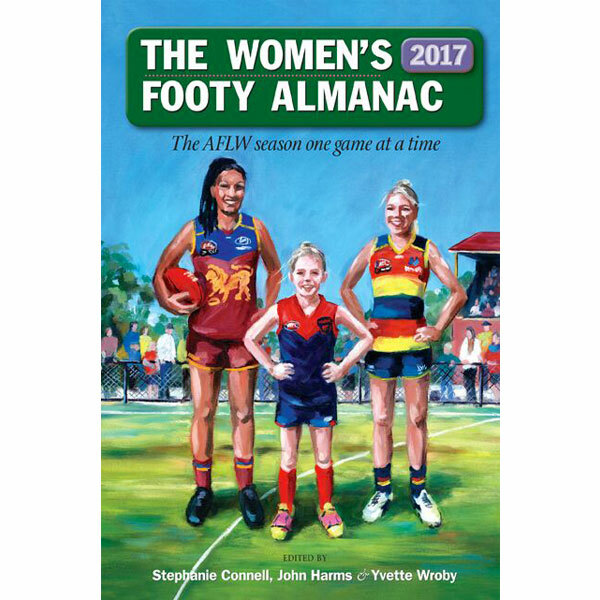 The Women’s Footy Almanac 2017 celebrates women’s footy and the inaugural AFLW season. It’s an insightful game by game account of the season written by our squad of talented writers. Re-live the historic moments. 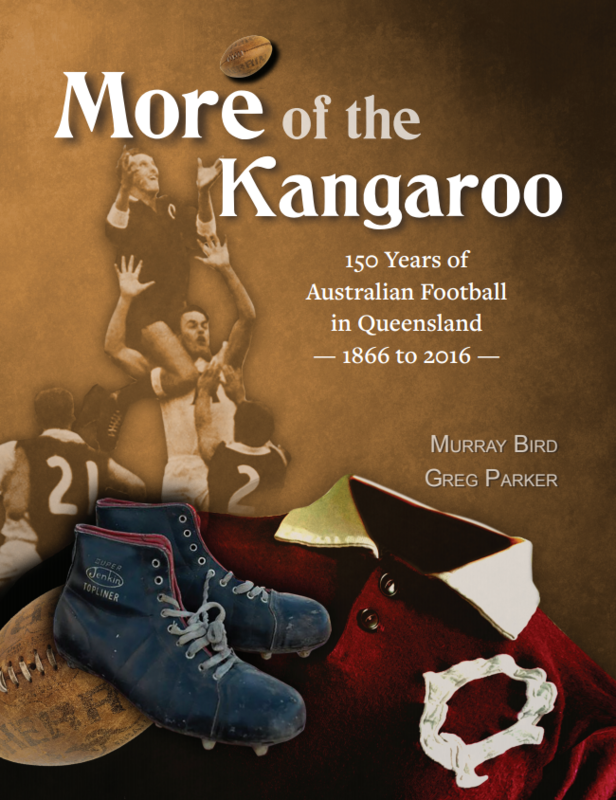 It also features some wonderful introductory essays which discuss the significance of this brilliant two-month period in Australian sport. 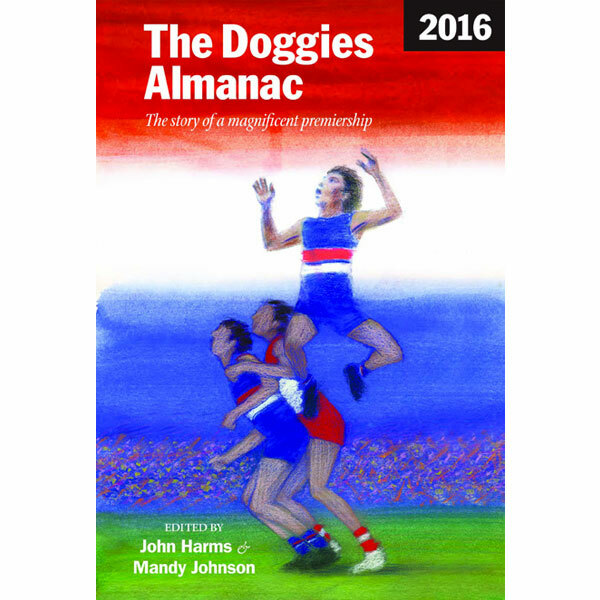 A must for all Doggies and football fans. 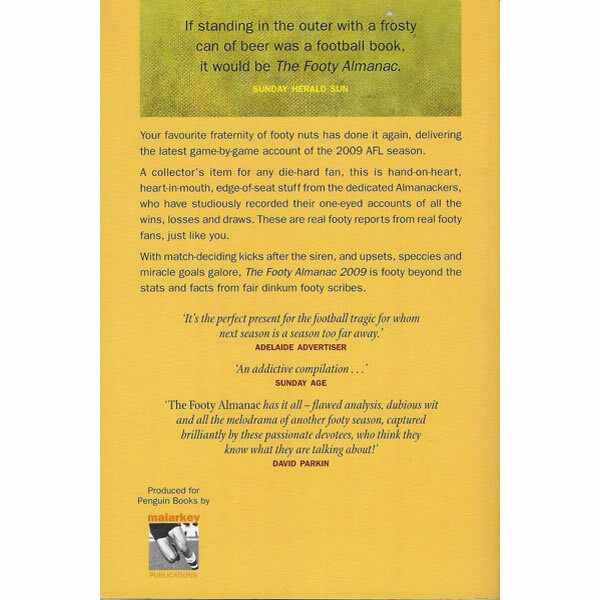 50 essays of memoir, reflection and of course a game by game account of a season like no other. The story of a footy club and what it means to people; a story of family, place, hope and belief, and a brilliant footy team. 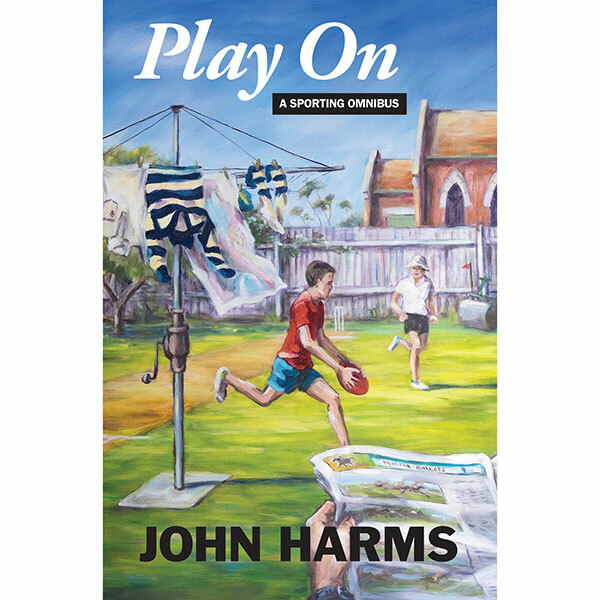 Play On is the omnibus of John Harms’s three celebrated memoirs: Loose Men Everywhere, Memoirs of a Mug Punter, and Confessions of a Thirteenth Man. 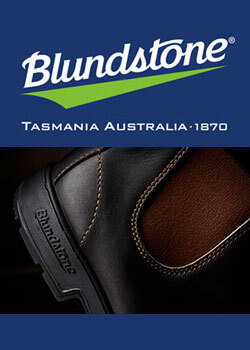 Critically acclaimed, they capture the heart and soul of Australian sporting life. 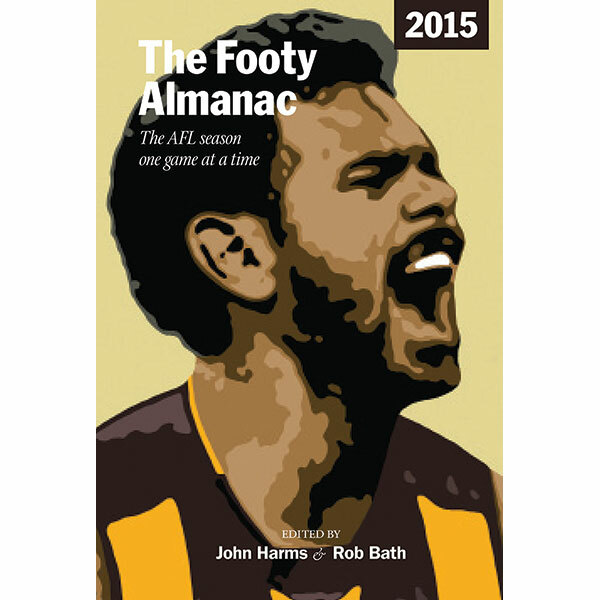 Save $$$ when ordering every edition up until 2017 of The Footy Almanac. 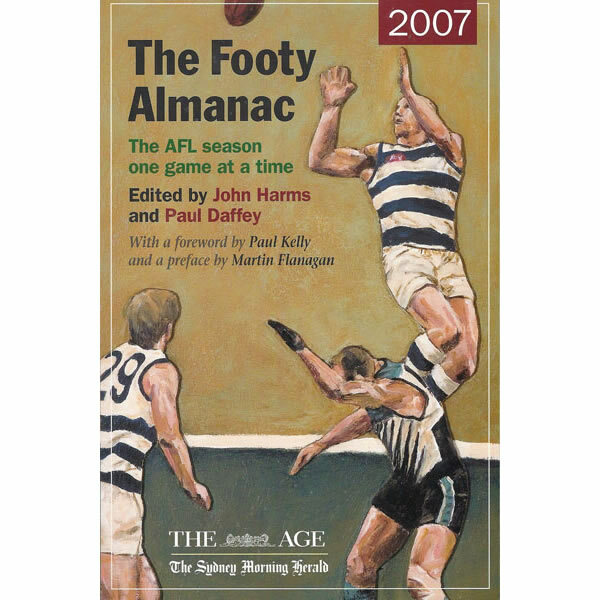 Purchase the Footy Almanac 2007 through to 2017 and save! 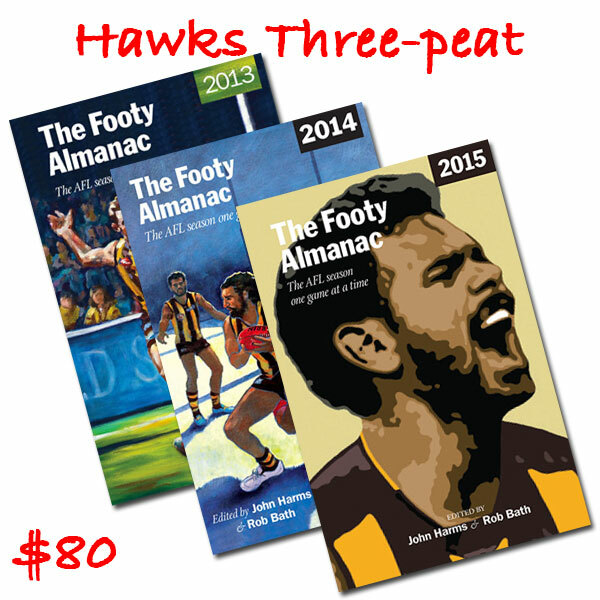 Save $$$ when ordering the Hawks Three-Peat Footy Almanac bundle! 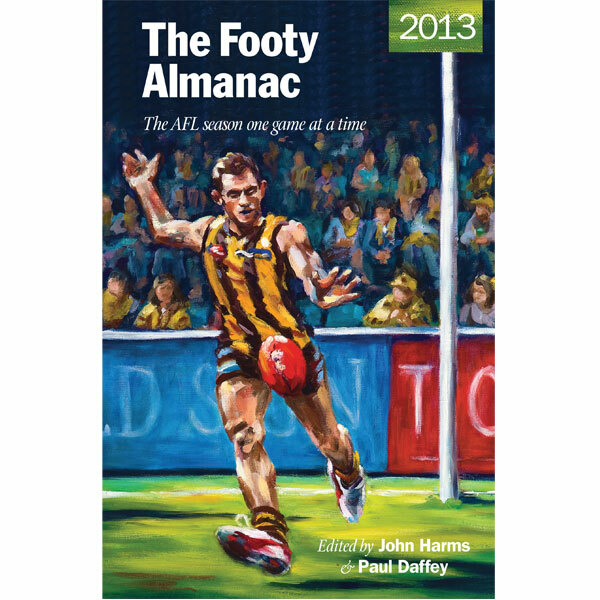 Purchase the Footy Almanac 2013, 2014 and 2015 and save! 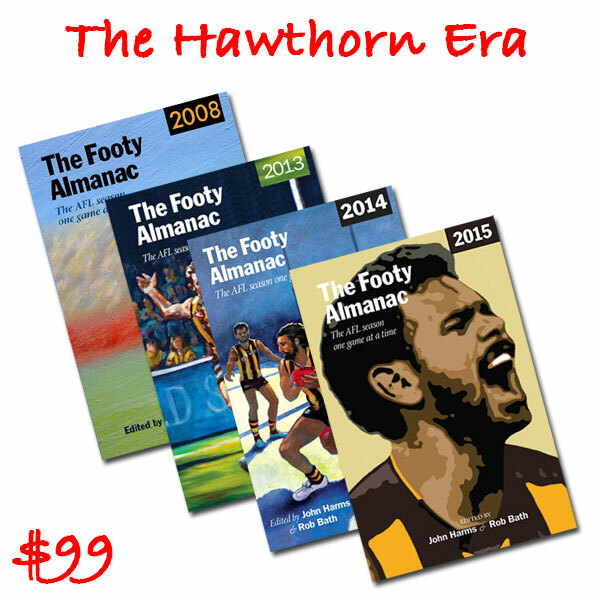 Save $$$ when ordering The Hawthorn Era – 2008, 2013, 2014 & 2015 Editions Footy Almanac bundle! 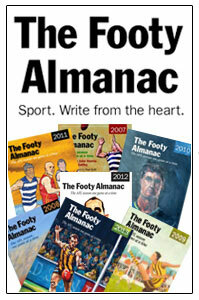 Purchase the Footy Almanac 2008, 2013, 2014, 2015 and save! 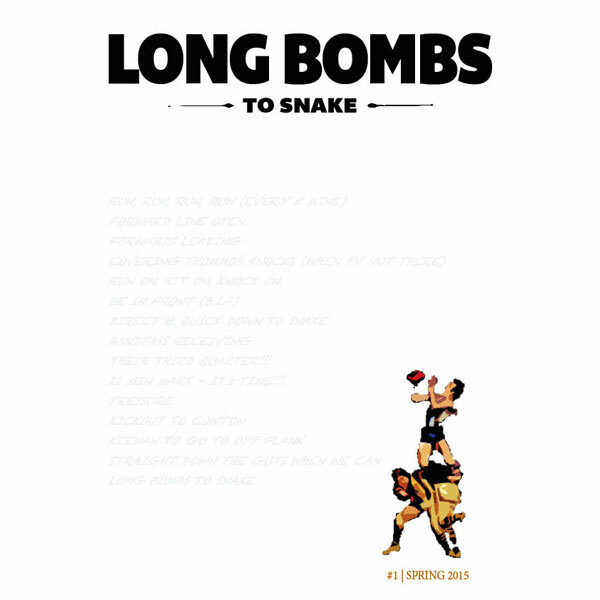 Long Bombs To Snake is the magazine of the Almanac community. 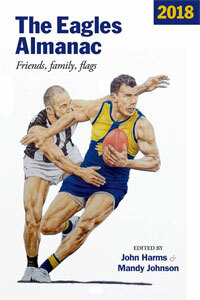 It is 64 pages of quality feature-length writing on numerous sports by twelve of our talented Almanac contributors such as Mathilde de Hauteclocque, Matt Quartermaine, Mickey Randall, Dips O’Donnell, Matt Watson, John Harms, Callum O’Connor and more. Fresh pieces from creative voices. This option is for the PDF version delivered via email. Suitable for Desktops, Laptops, iPad and all tablets. See product below for printed option (delivered via AustPost). PRE-ORDER NOW! Orders will start shipping on 14th November 2013. What an AFL season! 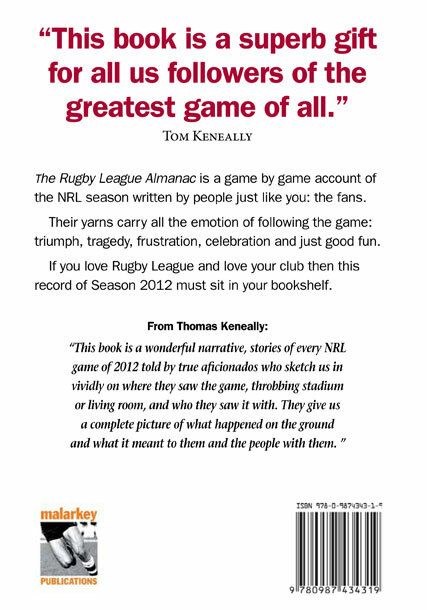 And it’s all captured in this collection of footy yarns by these passionate Almanackers. 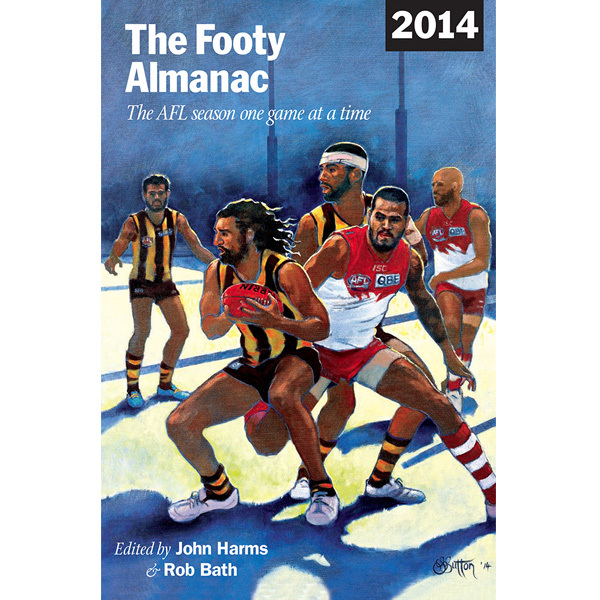 This game-by-game account, by footy fans, tells the story of this most remarkable season. 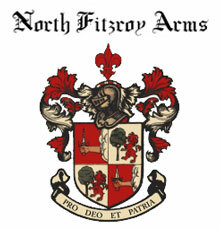 Are you crazy about your footy club? Are your team's games the first thing you write in your new diary? Have you worn an ear-plug during a wedding? Do you have a pair of lucky undies? Is your gold fish called Chappy? When the final siren for the season has sounded, what do you do for the next six months? Don't worry, help is at hand. 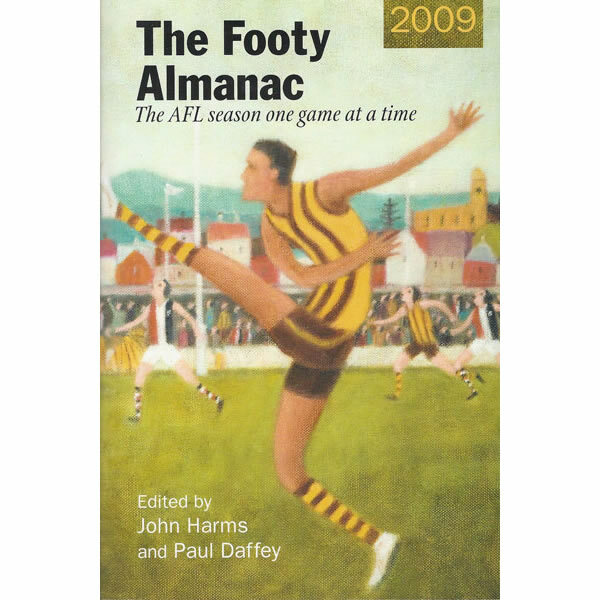 You can relive the season, game by game, in the Footy Almanac 2010. 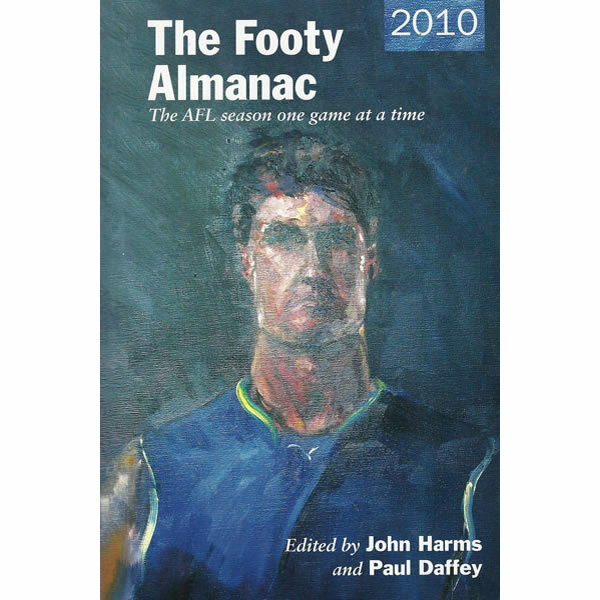 Your favourite fraternity of footy nuts has done it again, delivering the latest game-by-game account of the 2009 AFL season. 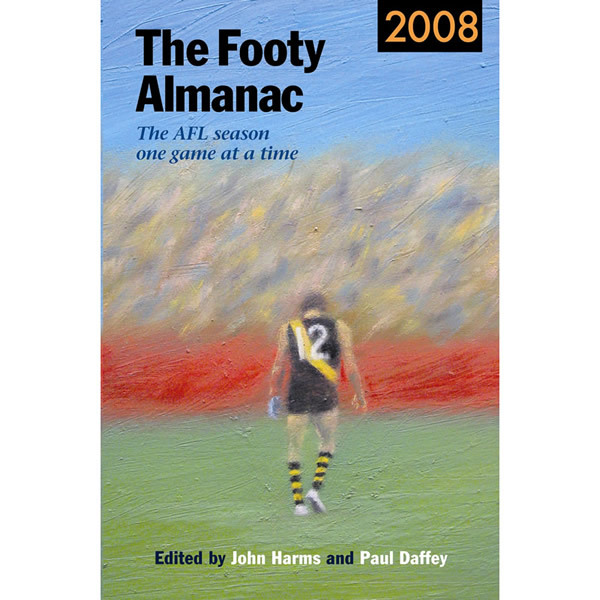 Relive the joys and sorrows of another year in the life of the people's game with The Footy Almanac 2008. 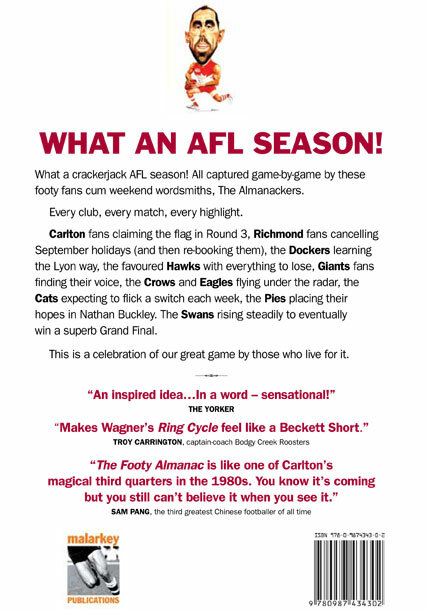 Our motley collection of straight-talking footy fans has banded together to write about what really matters - the on-field action, not the off-field dramas! 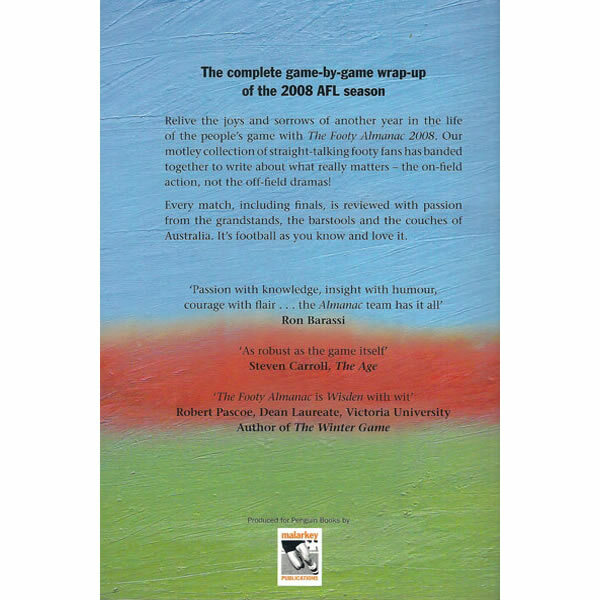 Why has there never been an amusing, insightful, game-by-game review of an AFL season?" Well here it is. 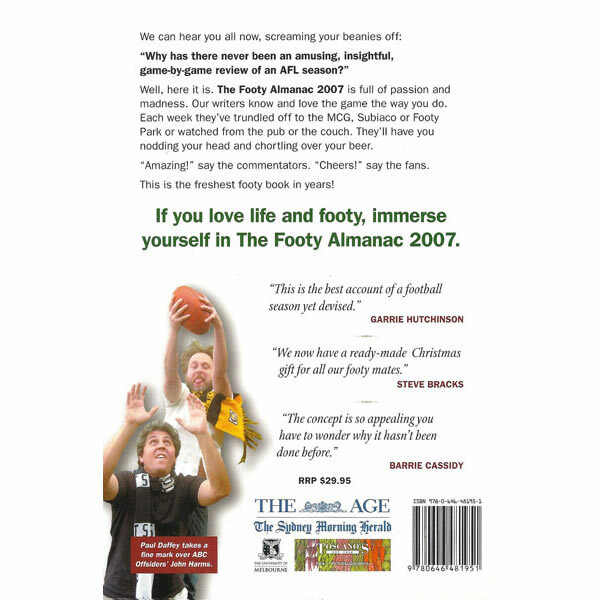 The Footy Almanac 2007 is full of passion and madness. Our writers know and love the game the way you do. 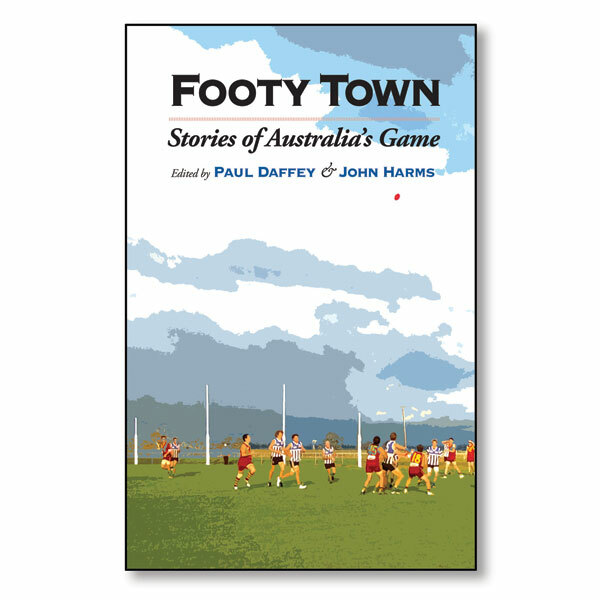 Footy Town is a collection of football yarns from around the nation; stories which celebrate footy at its most local: from New Norfolk to the Tiwi Islands, from Rockhampton to Kalgoorlie, from Edwardstown to Fitzroy, and all the way to Mangoplah Cookardinia United. 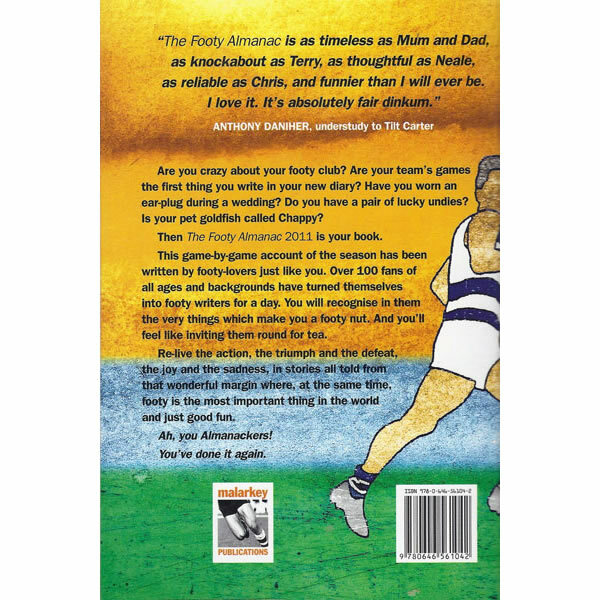 Written with great love by players, has-beens and fans, they tell of footy clubs and the people who’ve made them, whether in the suburbs or the bush. They paint a vivid picture of footy’s rich culture; a picture of mud and dust; of Dencorub and the clack of stops; of lumpy back pockets and racehorse half-forwards; of spiralling torps and once-upon-a-time drop kicks; of savs bubbling away forever. This is footy; this is Australia’s Game. 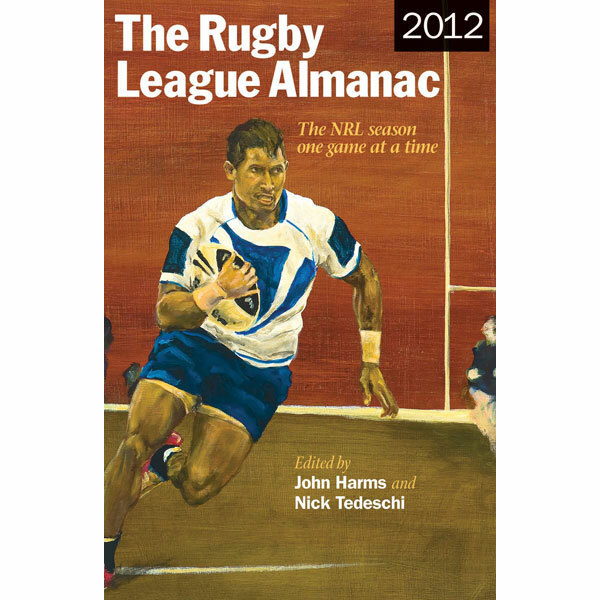 This is the book that football fans have been waiting for – The Rugby League Almanac, a report of every match of the 2012 NRL season.